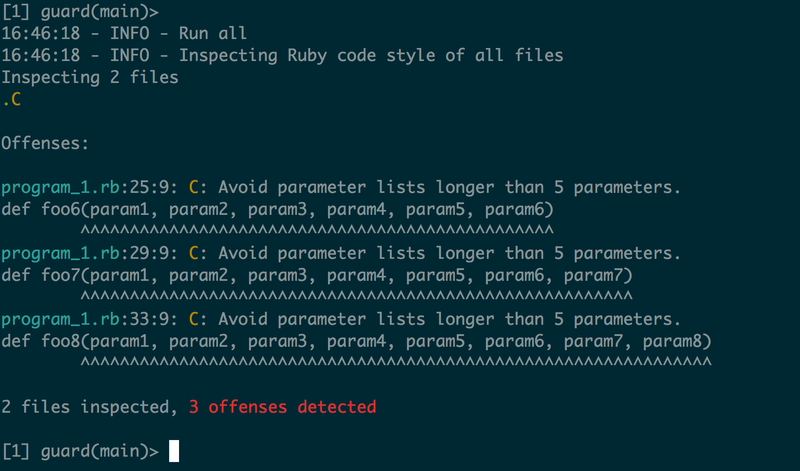 Rubocop is a Ruby static code analyzer. Rubocop utilizes a number of style rules, which it calls “Cops”, hence the name. Here I’m going into my practice directory and making a new one. I then setup the directory to have RVM load Ruby 2.1.5 and the davinci_coders gemset. Next I need to add the guard-rubocop gem. Next we need to bundle in order to install these gems. Then we’ll initialize guard. Now we need to tell Guard to ignore the Guardfile. We’ll fire up Guard, and we get no offenses. Let’s add a Ruby file called program_1.rb. So it looks like Rubocop will complain if your method has more than 5 parameters. Looks like this preference comes from the Ruby Style Guide. I’ll have to remember to have 4 or less parameters for any methods I create in the future. No, that’s probably a bad idea. Nevermind.